Privet (Ligustrum) is a collection of species best known for its use as a hedge. Depending on species, privet can be evergreen, semi-evergreen, or decidious. They are from Europe, China and Japan. For the purposes of this article, the focus will be on common privet (Ligustrum vulgare). It is a semi-evergreen shrub from Europe. Privet shrubs have dark green foliage. They bear white flowers in summer which are followed by dark purple berries. While the flowers are pretty, privet is primarily grown to form a thick, inpenetrable hedge. They can reach a heigth of four to 15 feet and a width of four to eight feet. Privet grows in zones 5-8. It is generally planted as a small shrub from a container, so can be planted any time of the year. However, the plant does better if planted in the fall to allow the roots to grow before the top growth commences. Privet does best in partial to full sun. To properly prepare the site where the privet hedge will be planted, till the earth to a depth of six inches. Work three inches of compost into the bed. This loosens the soil and improves drainage. Dig a hole that is slightly bigger than the rootball of the shrub. Remove the shrub from the container by grasping the base of the shrub and pulling it out of the container. Place the shrub in the hole, making sure the roots are well spread out. Fill in the hole with the dirt that came out of it. Make sure the shrub is level with where it was growing in the container when the dirt is filled in. Cut the shrub down by one third of the top growth. Water in well. Privet is a hardy shrub that does not need regular fertilizing or regular watering once established. If in a drought, water one inch a week. Otherwise, the privet will live off the rain that naturally falls on it after the first year. The first year, you will need to water it one inch a week so it can become established. Privet needs to be pruned after the flowers bloom. It needs to be pruned three to four more times each summer. Cut approximately half of the growth off since the last pruning. Prune any suckers at the bottom of the shrub so the hedge does not spread. Cut the top of the shrub off square to make a nice hedge. Privet is resistant to diseases and pests. An evergreen dwarf species from Japan, this species grows two to five feet high. It has thick leathery leaves and flowers in white panicles. The primary use of this species is as a dwarf bush in hedges. This native of China and Japan grows into a shrub from five to eight feet high. It has white flowers on spikes in the summer, followed by dark berries. This species is also called Lingustrum amurense. This evergreen is also called Ligustrum sieboldi. It is a dwarf with pointed leaves that are two to three inches long, leathery, and deep green. The flowers are on straggling panicles. This large tree, growing over ten feet, is also called Lingustrum sinese latifolium. The tree has firm leaves that are five to six inches long and over two inches wide and have a luster. The flowers are in panicles that reach six inches long in the summer and fall. This Chinese native also comes in variegated and there is another variety, called L. alivoni, that has longer leaves. This variety is a shrub that is commonly used as a hedge because it retains its foliage through the winter better than common Privet. There is a yellow varigated variety of this species, but the varigation fades as the shrub ages. This showy Chinese dwarf has small leaves and branches covered with a purple down. It flowers freely in the summer and fall. This Chinese tree can attain a height of 15 feet. It is not terribly cold hardy, but is drought resistant and does well in warm areas. It flowers freely and bears purple berries. 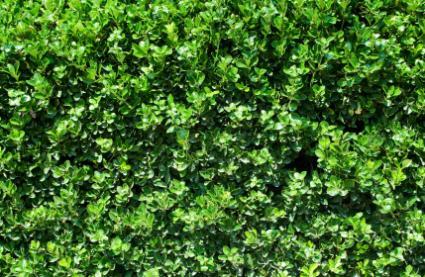 Privet makes a wonderful, thick hedge that can assure privacy when a fence is banned or not practical. 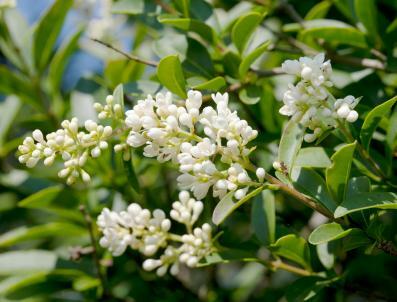 However, privet is poisonous and since it is not evergreen in the North, will look nice only three seasons of the year. Privet was imported in 1852 and widely planted because of its ability to withstand pollution and make a thick hedge. It has now naturalized in many areas of the United States and is considered an invasive plant. Consider both the pros and cons of this plant before putting it on your property.